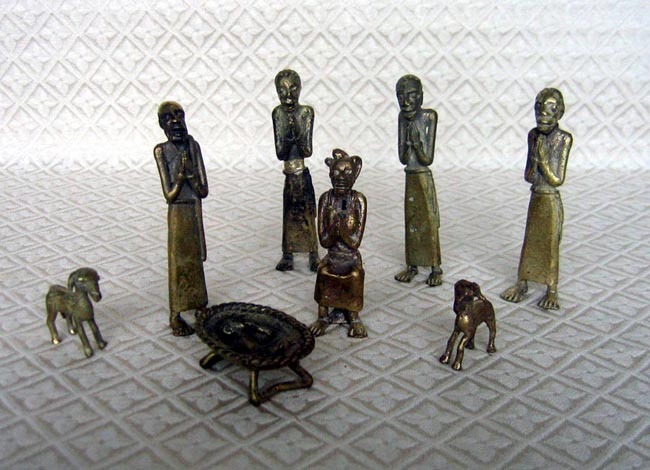 This unique 8-piece brass Nativity from Cameroon was created using the lost-wax casting technique. In this labor-intensive process, the artisans make individual wax figures over an open fire until exact. Reeds, as tubes, are fixed to the top of each figure. The wax is then dipped into finely powdered mud several times, with hardening in between applications. This process forms a clay casting around the mold. Next, the clay is heated until the wax melts and pours out. Using the tubes, molten brass is poured into the space left in the clay form by the wax. When the brass has cooled, the clay is broken away. Any necessary finishing details are then done by hand. The tallest figures measure 3.75 inches high. This set is distributed by PRESCRAFT, which was started in the early 1960s as a mission project of the Presbyterian Church in the northwest province of Cameroon. Its goals are: 1) to provide employment, 2) to stem the flow of peasants from the rural areas to the cities, 3) to preserve traditional craft skills, and 4) to instill self-confidence in the craftsmen. Currently, about 75 artisans are marketing their products through PRESCRAFT. Three well-equipped workshops in the villages of Bali, Bafut,and Bamessing produce musical instruments, brass, ceramics, woodcarvings, baskets, and toys.